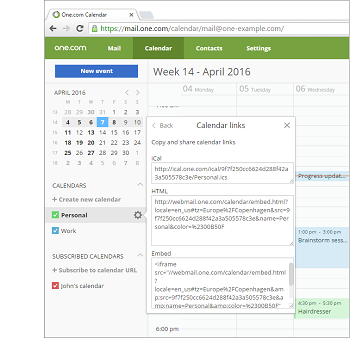 Easily share your calendar with others, either with an iCal link or by publishing it online. Create a unique link for each person you want to share with and keep control over who has access. Log in to Webmail and click Calendar. Hover over a calendar and click the cog wheel to open Calendar options. Click Add new link and enter a description under comment. Click Share. 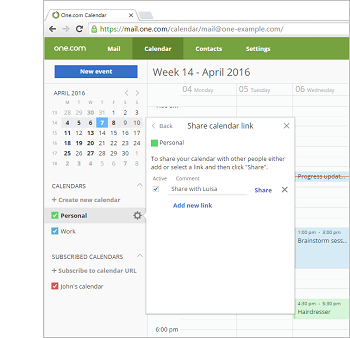 Copy one of the links and implement it in your site or give it to the person you want to share your calendar with. Close the window when you are done. What can I use the different sharing links for? iCal - This link can be used to subscribe to your calendar. It will be updated continuously, reflecting any changes you make. Your friend or colleague can keep track of your schedule, but won't be able to make any changes. In Webmail you can use the iCal link to subscribe to calendars. HTML - With the the HTML link you can publish your calendar online in a full page. It is not possible to make any changes in a published calendar. To see more details, click on a scheduled event in a published calendar. Embed - The embed code can be used to insert your calendar in an existing webpage. Visitors can see your calendar, but can't make any changes. To see more details, click on a scheduled event in a published calendar.